For the last 2 years, I’d been sending nengyajo – postcard for friends in Japan and outside Japan. 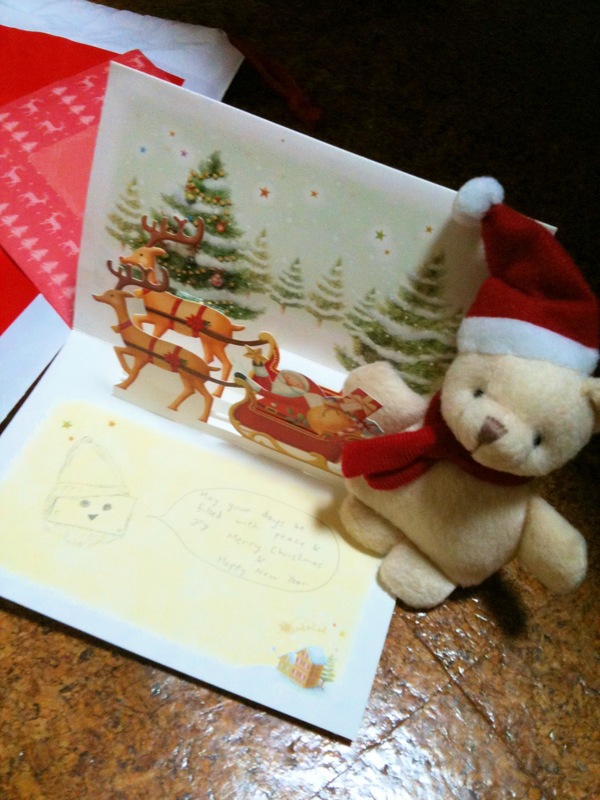 I prepared buying, hand writing like somewhere in November, but this year I haven’t even bought single postcard, I am afraid I spent time buying lil presents for friends, baking and attended some company and pre-christmas events. 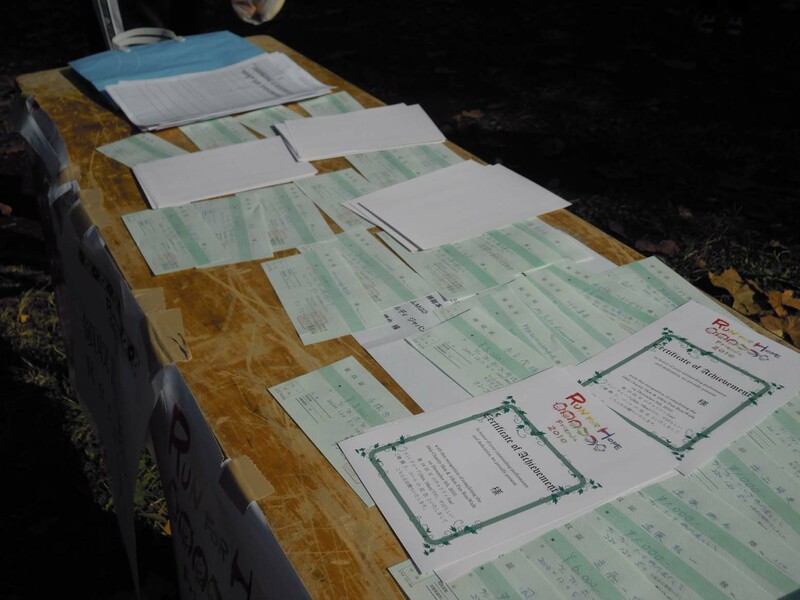 The participation fee is the donation of at least 3,000 yen with the targeted participants as many as 1,000 people. 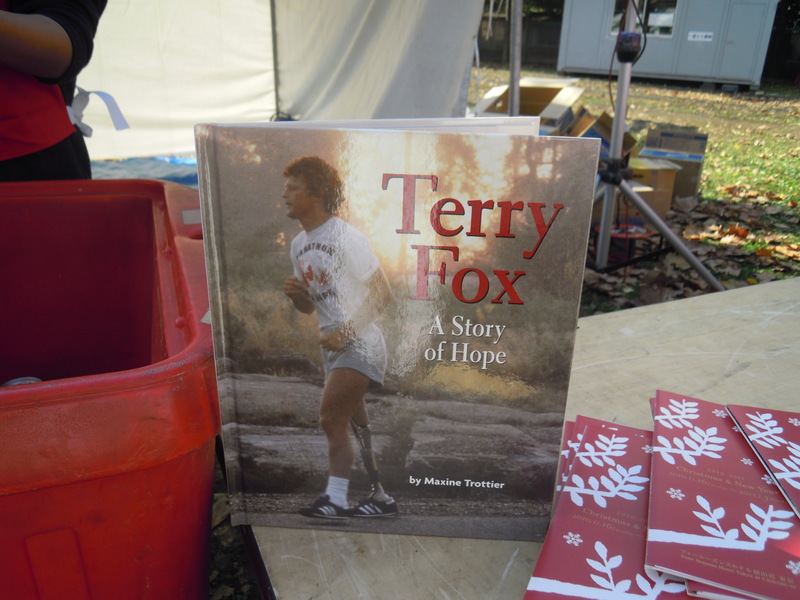 This is an annual event held by the support of Canadian embassy and Four Season Hotel. 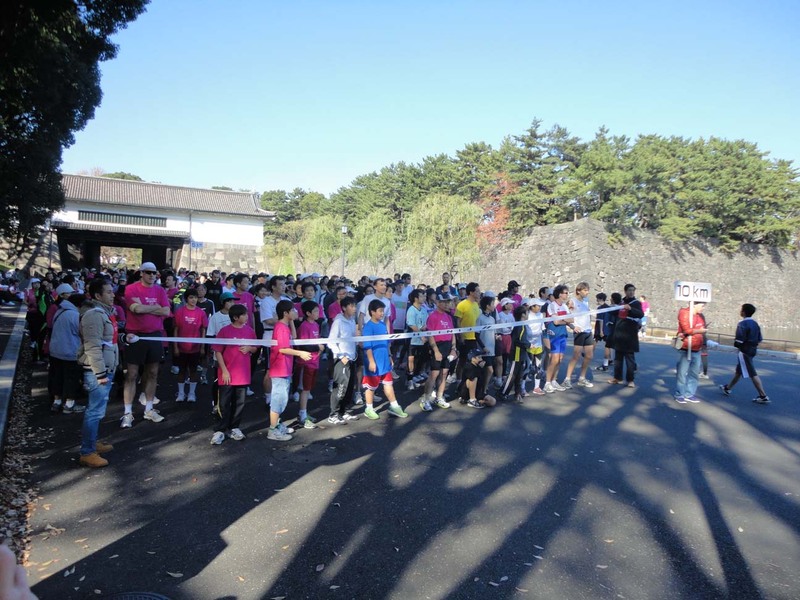 And the running itself takes place in Imperial Palace, giving the option of 5km or 10km run. Not all the employees ran. almost half enjoyed good walk, the other half participated the 5km run, and a few completed the 10 km run. Unfortunately I only managed to run a 5km course, stamina’s dropped due to no endurance training since winter. 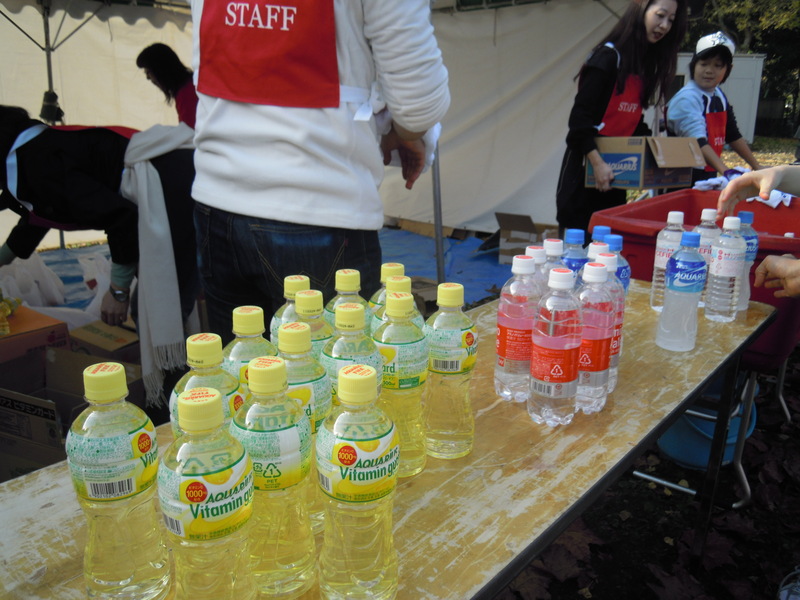 At the end of the run, each participant was given a bag of banana, apple, ham bread sausage, energy drink. 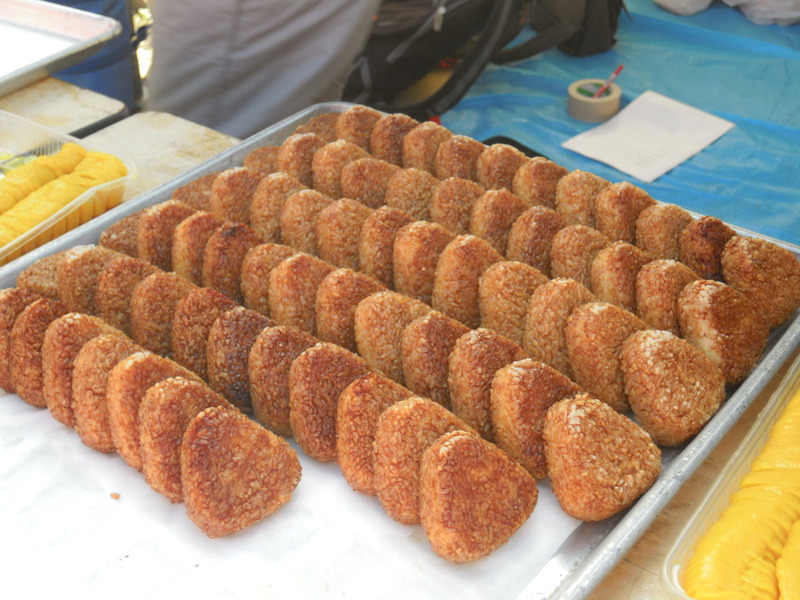 They also provided salmon snack and yaki onigiri – grilled rice ball for free. The interesting parts are also that they gave out the participation certificate with the name of participant on it. And also there’s lucky draw, we’ve got piles of numbers.. And guess what I got? I got 3 coupons and I got 2 prizes out of those three. 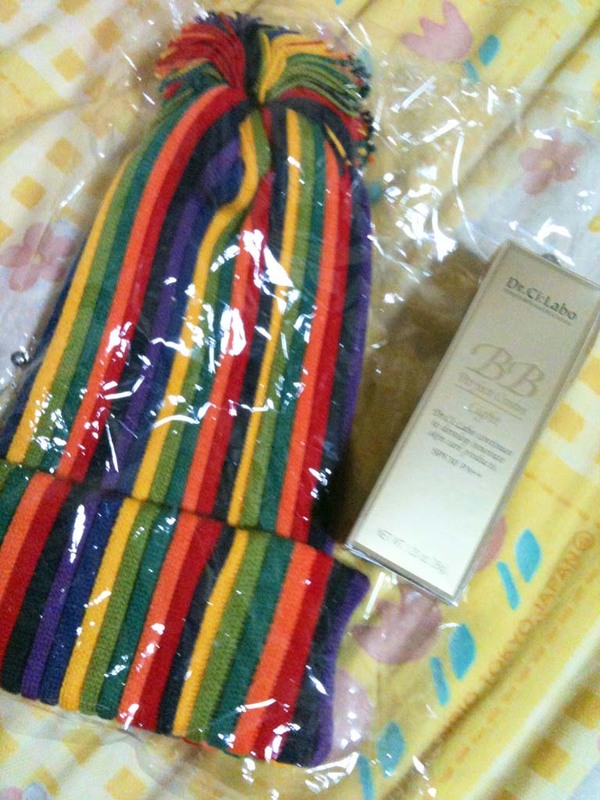 It’s a cute winter cap and also a Dr Ci LaBo BB Perfect Light Cream which costs like 4,200 yen. Lucky! The first prize is Four Season Hotel stay. And are you ready to see how I looked like in the party? 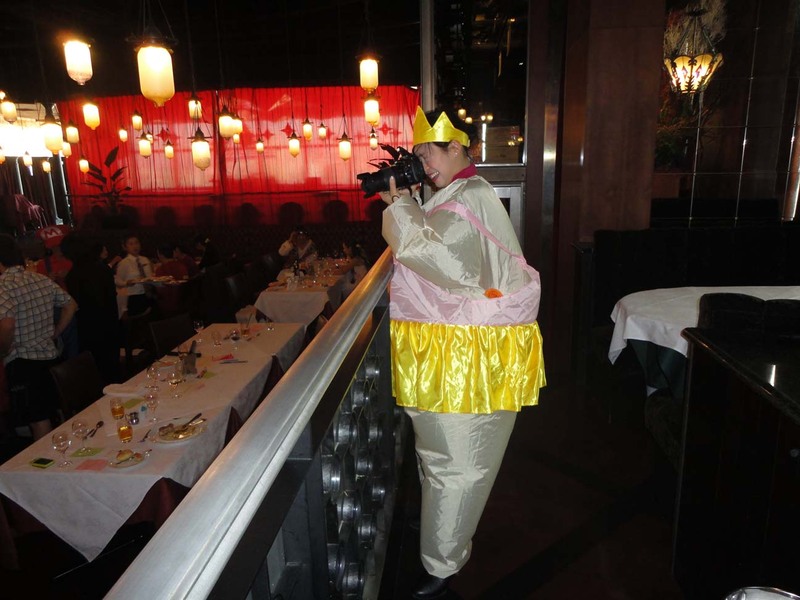 The most embarrasing costume among the ladies. But at the end of the party, I got the 3rd prize where I got Quo Card – the voucher that can be used in convenience store, and also a bottle of Wine. LOL. And we also had the Secret Santa. It’s like a month ago, the employees drew one small piece of the paper. The written name on the paper is the one we need to present to, within the budget of 2K yen. 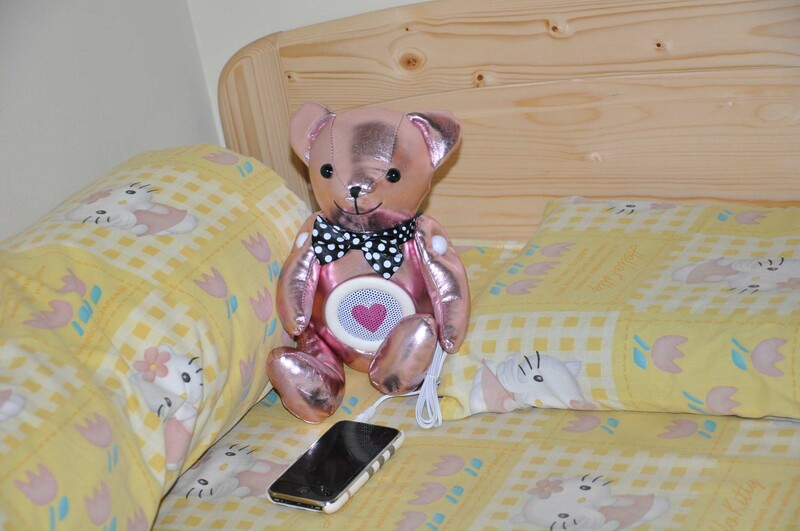 I got the pink speaker bear doll. 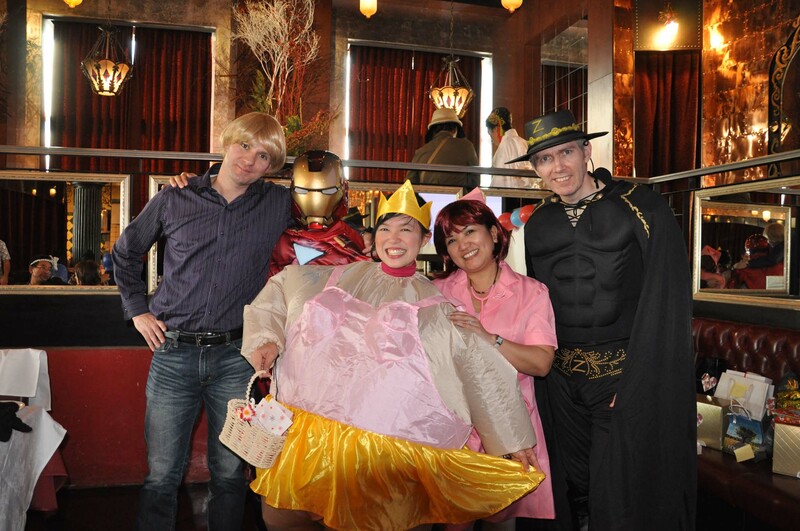 Yes, the party ended until san ji kai (i mean this is the third round party) after the first main year-end event. We went to two other different places drinking, which made me itchy the next day and heavy-headed all day. It’s also the day for annual Christmas celebration for Indonesian Christian Association in Meguro. Thanks for the invite Inge. It’s such a great event.. I laughed a lot, having so much fun enjoying the Japanese senior citizens singing Indonesian songs and their own creative song, singing along with the guest singers – Naomi and Maria, also I dropped my tears when listening to the 6th year grade girl reading her own poem which made her the winner in the International competition of the Indonesian students who have their study abroad. Unfortunately, I left earlier before the event ended due to headache probably due to the three parties a night before. Teddy for a free trial baking class. And thanks for the presents, Teddy and Inge.. I appreciate it.. I sincerely just gave the lil present last time without asking for a return..
Ok, so this is the end of this time-posting.. Again wish you enjoy a festive season..
great site missus! well worth the 3 hours ; ) happy christmas! WOW you’re such a busy lady, hehehe… delivery dr sini (UK) ke sono mahal ya? coba kalo aku yg kirim kira2 lbh murah ga ya? Anyway, those bakings look yummy!!! Ga sibuk amat jg, subjektif pan ya..
btw Merry Christmas & Happy New Year ! Itu rasanya ga gitu enak, lebih demen onigiri biasa pake tuna mayonnaise. hehe..
Kreatif.. kreatif, ada sumo pakai tutu hahaha… pantes dapat juara. Mudah2an ada order terus ya, kan lumayan tuh dengan banyak latihan pasti cakenya makin yummy. Merry Christmas and Happy New Year for you too..
keke.. itu bikin malu sendiri sebenernya El.. garuk2 pala..
Yo i.. paling ndut sendiri.. bos gua juga kalah. padahal bos gua dah termasuk versi gede bulat gitu.. lol..
seru ya acaranya, trus lu hoki lagi dapet doorprize banyak. hihihi.. iya nih Viol.. malu banget yaaa..
anyway too early but happy holiday and happy new year!!! 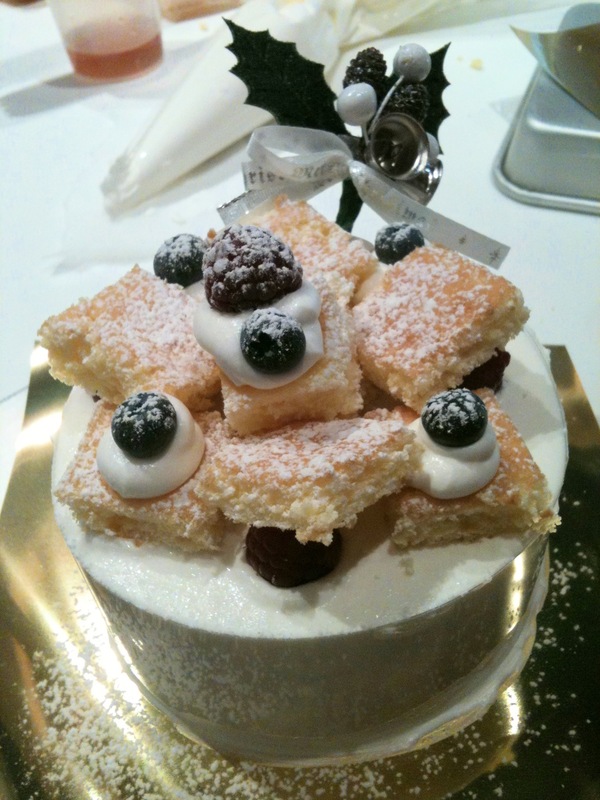 kekeke, it’s ABC season class recipe Tis..
It’s not easy to do that without being supervised though.. The same to u, happy new year..
Wah finally di update. Sibuk banget ya Wil? Gmn di jepang lebih dingin dari tahun lalu? Cuacanya suka aneh, kadang masih panas ga berasa kaya winter, kadangan ujan, kadangan dingin winter..
Merry Christmas & Happy New Year, Wil. Your Blogosphere fans owe you one … three hours uploading! Great result though. One critical note: what’s wrong with looking like ( and temporarily being) “an adorable wow beautiful ballerina”? 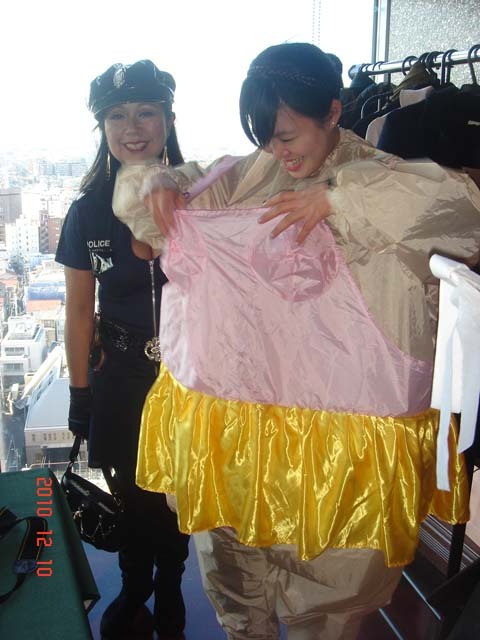 Though of course nothing beats the spectacular prizep-winning costume you show in the pictures. Hi Opa Colson, great new year to you. Wish you and family happiness in 2011. Hai Willy, maaf yah tapi gw ngakak deh lihat kostumnya, tapi seru lah ya mumpung masih muda harus berani gila-gilaan hehe. 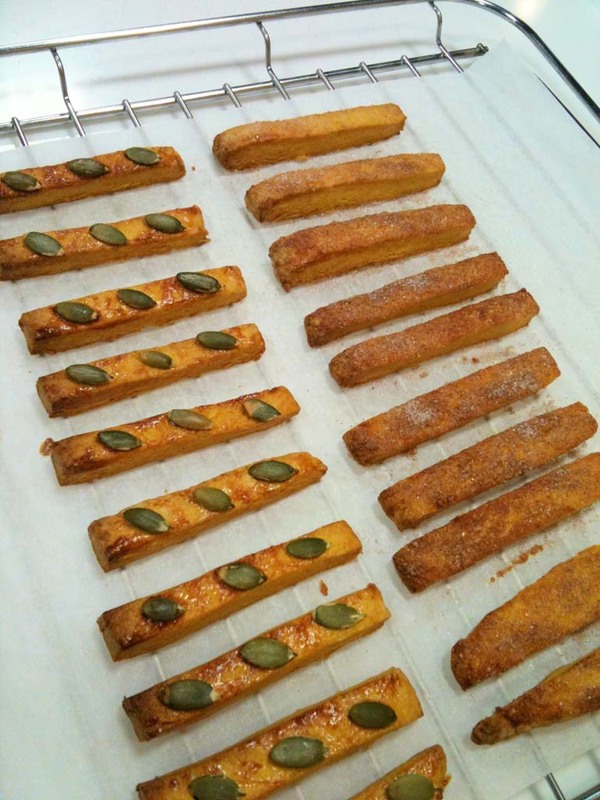 Pumpkin stick pie kayaknya enak. itu garing crispy kayak cheese stick atau gimana Wil? Soalnya dulu gw buat kukis kabocha tapi jadinya kenapa chewy gitu ya? Hebat yah elu dapet beasiswa ke Jepang, selamat yah udah lulus, papa mama pasti bangga setengah mati. Udah kebaliklah mobil yang dijual sama hepinya mereka :). Congrats yah dear! Wah bagus tulisannya. Masih di jepang ya? Hai Willy, how are you? I heard the news about tsunami. Hope you are okay.